Ubisoft effectively distills all the best elements of a traditional JRPG into a fun and beautiful 10-15 hour package. 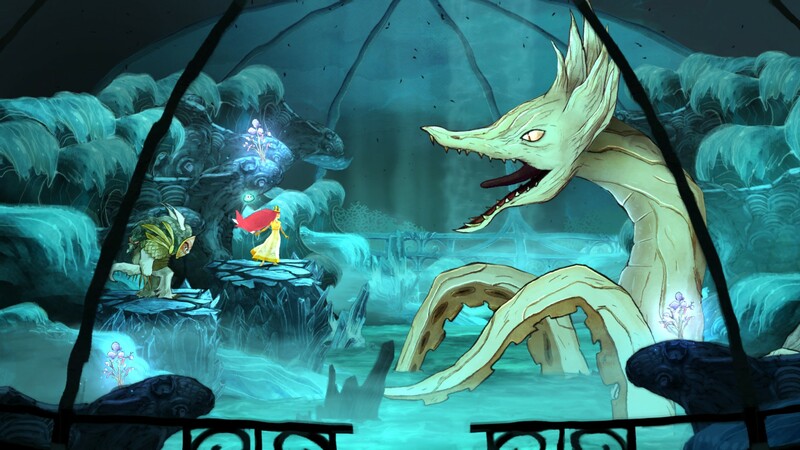 Charming, fairy tale-like indie games are all the rage right now – even AAA publisher Ubisoft had to get in on it. 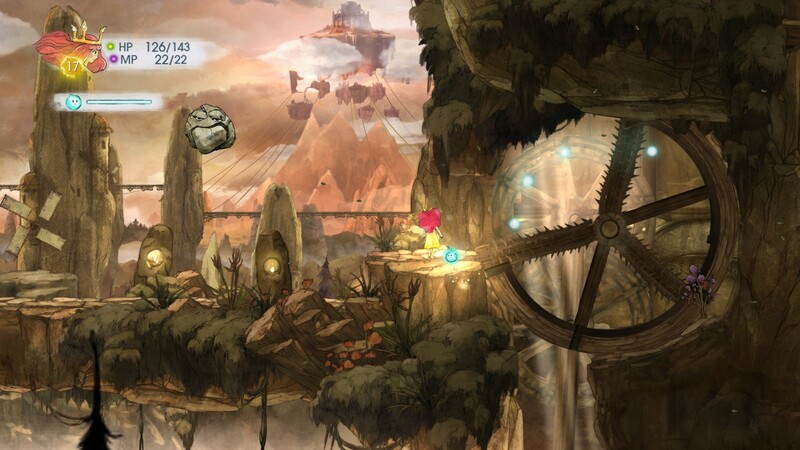 Child of Light isn’t an indie game at all. Instead it cleverly distills the best parts of the normally long and bloated JRPG into a tight 10-15 hour experience. 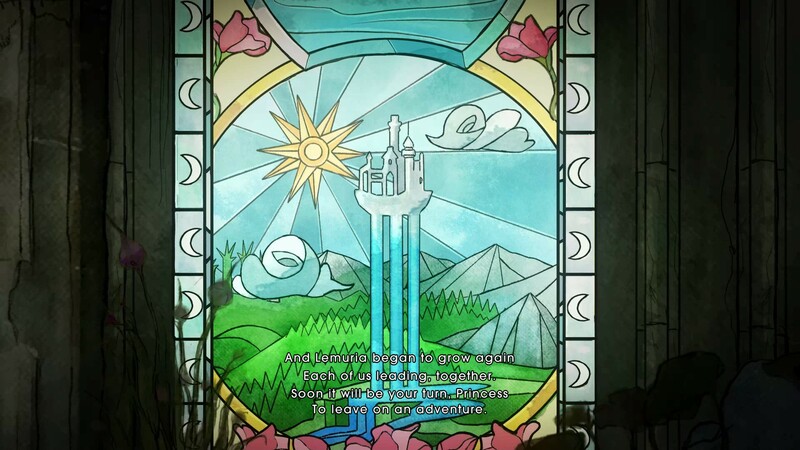 It’s lovingly wrapped up in a beautiful hand-drawn art style and expressed through a constant rhyming structure throughout the whimsical dialogue. The story is a bit basic and linear, but overall the condensed RPG experience works remarkably well. Our precocious young heroine Aurora, daughter of the Duke of Austria, falls into a death-like slumber. She awakens in the magical land of Lemuria, and finds the land under the terrible grip of Umbra, queen of darkness. A personified ray of light, Igniculus, is created by the Lady of the Forest, and the two are charged with bringing back the sun and stars. It doesn’t get much more fairy tale than that. The magical world and its inhabits reminded me of The Wizard of Oz. 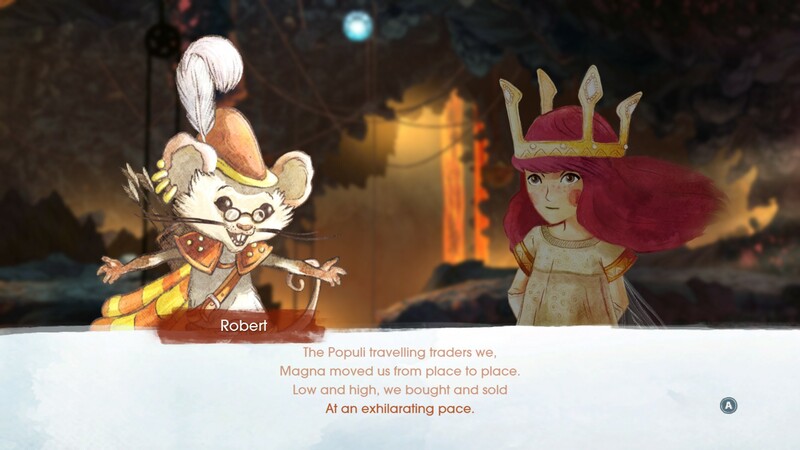 Aurora meets up with colorful characters from various factions, like the gnome-ish spellcaster Finn of the Capilli and the business-savvy Robert the archer of the capitalistic mouse-people Populi. Their distinct personalities and combat specializations shine through, and the way they all rhyme with each other is impressive, thought a bit tiresome. After the first boss fight Aurora is granted the ability to fly, completely opening up the world and adding an incredibly fun element to exploring each area. Each zone is designed around the flying protagonist with tons of vertical space to explore, including hidden areas, treasure chests, and traps. Enemies are seen on screen, and Igniculus’ ability to stun them makes avoiding fights dangerously easy (dangerous to quickly become a bit underleveled if avoiding too many foes). Combat shifts to a familiar turn-based RPG afair with the all-important action time bar at the bottom. Up to two allies and three foes can battle at a time, keeping combat flowing smoothly and quickly. Thankfully you can switch out party members on the fly in the middle of combat, allowing you to set up some pretty satisfying combos are exploit enemy elemental weaknesses with certain party members. The time bar becomes the most important element in combat, and many abilities and attacks directly manipulate it, from knocking foes backwards (essentially preventing them a turn) to hasting allies to go more often. 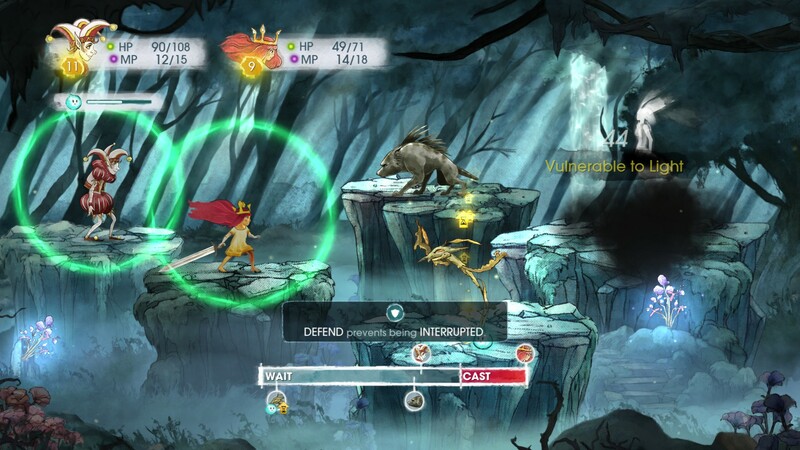 Child of Light is the first RPG I’ve ever played where selecting the Defend option is not only a solid tactical choice, it’s very necessary to avoid being knocked back if an opponent moves before you. Buffing and supportive spells become highly praised as well, protecting, hasting, and healing allies. Each party member has their own large web-like skill tree with three main paths they can select to gain and improve new abilities. Like Path of Exile most skill points will be spent on passives, simply raising a character’s HP or Defense, while you work your way towards upgrading important abilities. In another nice addition, all party members gain experience whether or not you use them in combat, allowing everyone to remain at full strength and be useful at all times. It’s a great example of how Ubisoft streamlined classic RPG elements into an intuitive system. Most of the game scaled quite easy, which is perfectly fine as I selected Casual over Expert on difficulty level. A steady ramp in difficulty worked well towards the end, and I particularly enjoyed the well-balanced boss battles that encouraged me to counter their attacks and utilize specific strategies. The only inventory system lies in the occuli, elemental gems that can be found, crafted, and equipped on each ally. Everyone has a slot for weapon, defense, and accessory and the gems work differently depending on where the’re equipped, not unlike the slottable gems in Diablo. Gems can grant elemental attacks (ruby for fire, topaz for lightning, etc) which is incredibly useful against most foes. Unfortunately there wasn’t a way to check who was equipped with what during a fight, so I began to color coordinate my gems with the characters themselves (the blue-dressed Tristis got a water sapphire, etc). While the world was fun to fly around in and the art was fantastic, everything was structured very linearly. A few side quests prop up in each area, but too many of them involved backtracking to previous areas filled with newly respawned foes, arbitrarily lengthening the game. A particular egregious example occurs late in the game, when you’re given the old “go back to each area and collect these things” quest, in which I loudly proclaimed “No thanks!” I enjoyed the overall experience but I did not feel the need to extend my play time much beyond the ten or so hour mark. The story was also very basic. I wasn’t expecting a grand tale filled with twists and turns given the scope of the game, and the single twist the story throws at you around the 2/3 point is pretty awesome. But the end becomes predictable and the final area and dungeon feel like they go by way too fast. I was actually shocked that I gained a final party member essentially right before the final dungeon, barely getting a chance to use her. 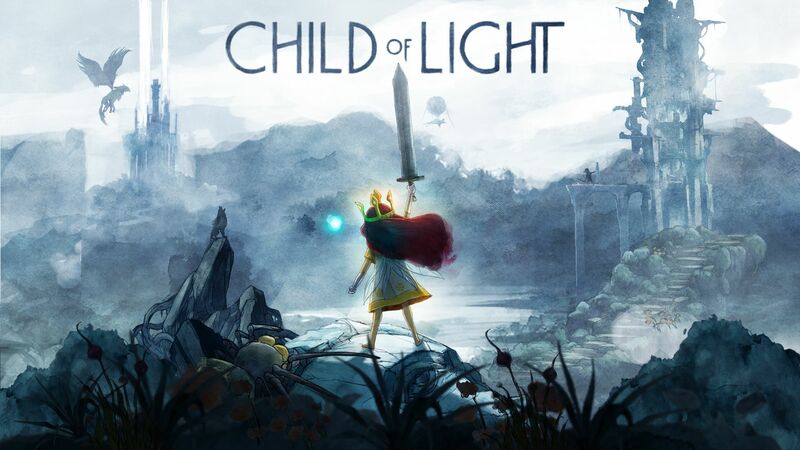 Child of Light is a fantastic experience, and I would absolutely recommend it to anyone that has even the smallest inkling for JRPG-style combat. The characters are fun, the art is fantastic, and the story is cute. Most importantly, the combat is a perfect balance between tactical and accessible, with some great boss battles. Ubisoft does a really impressive job with crafting a solid RPG experience within a smaller package. Final Say: Ubisoft effectively distills all the best elements of a traditional JRPG into a fun and beautiful 10-15 hour package.